Everything in the little Blue Mountain Beach studio is covered with paint—wet paint, paint that has long since dried, layers of paint in every color, all built up on top of even more drops and splatters. The floor, the tables, and the shelves on one side of the room look like there was an explosion of acrylic that no one could prevent. Locals who frequent Justin Gaffrey Studio and Gallery in Blue Mountain Beach or Seaside, Florida, know better than to touch anything, or even to wear something they would prefer not to get paint on. It is, of course, frowned upon to make a finger mark on a fresh painting, and that’s why those are stored safely in the drying room of the studio, but visitors are actually encouraged to feel the flexible-yet-sturdy make of a dry painting. Because that’s the thing about Justin’s work—the rich colors, the shiny petals of roses, daisies, or poppies, a nest full of hatched eggs, or bright blue waves rolling onto shore beneath fluffy white clouds—all make you want to just reach out and touch. 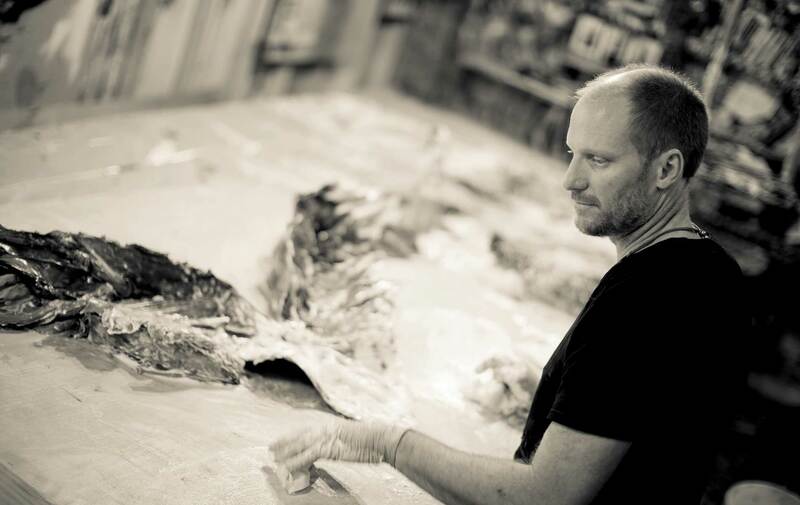 Which is exactly how Justin crafts his new sculpture series of paintings featuring wildlife such as butterflies, owls, herons, and eagles that seem as though they might fly right off the panel at any moment. The method behind the madness, or perhaps vice versa, does not end with his paintings or the culinary arts. Justin is a carpenter, a mason, a businessman, and a visionary. He’s always coming up with new ideas for how to display his work or how he can repurpose leftover paint that has dried in funky shapes and textures. “He’s like a little bird in here, building up new things with the scraps,” says Christy Milliken, the director of Justin’s galleries and studio. She is just one member of the team that keeps things running behind the scenes while Justin works. “Everything that goes into it is art, really, from the panels being built, to taking the photos of each painting, and displaying works in the galleries a certain way. It all goes into the visual aspect,” Christy says. Seaside gallery associate Katie Hudson has filmed the process of the paintings, creating a projected display of his work that plays after dark on the gallery walls for the benefit of people walking by outside. Katie is also collaborating with Justin on what he calls an IMAX-type video that will take viewers even closer to the creation process. Seaside gallery art consultant Mandy Mills is assisting with graphic design projects and promotional materials. The entire team, which also includes artist assistant Brian Wood and gallery assistant Kyle Paxton, is responsible for creating work that will give viewers a different kind of gallery experience. Something to talk about and remember—and, hopefully, take home with them. Justin Gaffrey’s work is in homes across the country, and with recent tours and painting exhibitions in cities such as Nashville and Birmingham, Alabama, the word is spreading all the more quickly. He will be a featured artist at the 2013 Digital Graffiti art show at Alys Beach, Florida, and will also create a piece for the new Lexus dealership in Nashville and unveil it there. Visitors to the Highway 30-A area are always encouraged to stop by the studio and gallery in Blue Mountain Beach to see Justin paint and to learn more about his process firsthand. For gallery information and hours, please visit www.justingaffrey.com or Like Justin Gaffrey Studio and Gallery on Facebook.